The company was recently ranked seventh on The Austin Business Journal’s list of the healthiest Austin-area mid-sized companies. BHI was recently named one of Austin's healthiest employers. 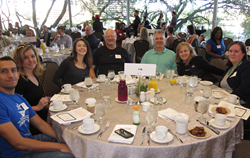 The Builder Homesite, Inc (BHI) team was recently honored at an awards breakfast in downtown Austin for being one of the city’s healthiest employers. The Healthiest Employers awards are given annually in several major cities by Healthiest Employers, an Indianapolis-based firm. The awards recognize organizations committed to creating a healthy workplace. The awards event kicked off with a fitness walk around Lady Bird Lake, followed by a healthy breakfast with opening remarks from Dave Kirchoff, CEO of Snap Kitchen. Heather Ladage, publisher of the Austin Business Journal (ABJ) also addressed the audience of 250 attendees. The awards were presented by Greg Barr, ABJ managing editor. The Healthiest Employer awards program utilizes an online assessment to measure wellness programming in six categories: Leadership Commitment; Foundational Components; Strategic Planning; Communication and Marketing; Programming and Interventions; and Reporting and Analysis. In keeping with BHI’s longstanding commitment to wellness, 2016 will also mark the third year that Builder Homesite has hosted more than 70 bicyclists from The University of Texas on the eve of their annual Texas 4000 Atlas Ride to raise money for cancer research and education. Headquartered in Austin, Texas, BHI was founded with the mission to bring homebuilding industry leaders together to develop world class technology solutions. BHI was formed in 2000 as a consortium of 29 of the nation’s largest homebuilders. Our flagship product is NewHomeSource.com, a consumer website featuring the Internet’s most comprehensive selection of new homes. Since its founding, BHI has expanded to provide digital solutions across a range of industries through its two companies: Builders Digital Experience (BDX) is a leading provider of digital marketing and sales solutions for the building industry and EX² Solutions helps businesses in every industry tackle critical opportunities with world-class technology. For more information visit http://www.builderhomesite.com.